I love, love, love a good deal. And babies are expensive, holy crap expensive. So we've been trying to find ways to lessen the blow some. And consignment sales are the perfect places to get a good deal! 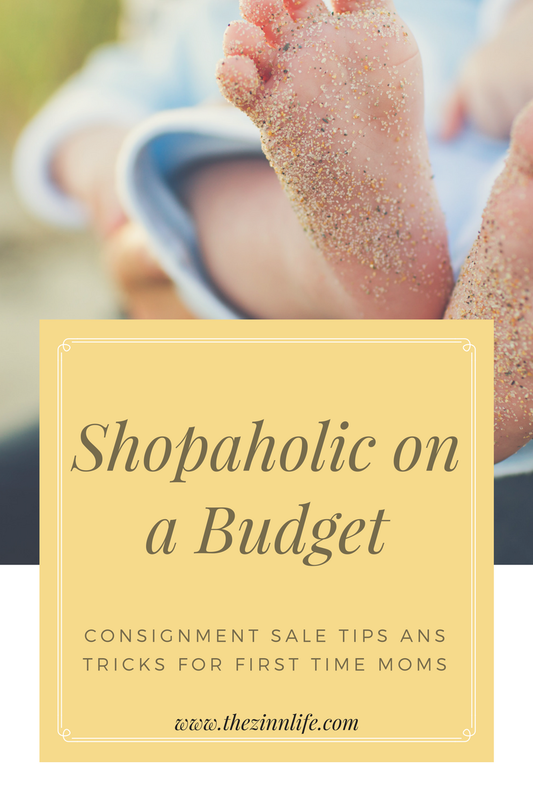 Now that I've been to my first round of consignment sales, I thought I'd share some tips for first time moms shopping consignment and how to avoid the "I don't want that stroller" meltdown that happened to me! Consignment shopping is an art form. You need to know when to go, what you want, what constitutes a deal, and how to shop. It's not like shopping at a regular store. There aren't multiple of the same item and they aren't always in the best shape. That's when knowing your products comes in handy! Here are some tips that I learned myself the hard way! 1. Pick the right shopping partner and be on the same page. The first time you shop a consignment sale(s) it helps to have a partner. My mom went with me to a smaller one and then Aaron and my friend Sarah went to other sales with me. Mom was good in that she helped me find a few items, but it was smaller consignment sale and didn't have the big ticket items that I wanted. My friend Sarah was the best to shop with. She's had three kids and was able to give me good advice as to what's worth it and what's not. She also found me a basically brand new convertible car seat for $125. Score. My husband, however, was the worst to shop with, but only because we were NOT on the same page. He wanted a good deal whereas I wanted to try and find what I wanted for a deal. So we ended up buying this Graco stroller that I don't like and refuse to use because it was $20. I've told him that is his stroller to use. A ridiculous meltdown and fight ensued, I went to bed crying. It was really bad. Over a $20 stroller. My advice? Take a girlfriend that's had a baby or two and call your hubs with what you find. It's much better that way! 2. Sign up for early access or even volunteer! A lot of sales will allow first time or expecting moms early entry to the sale. This is key! You can shop all the good big ticket items like strollers and car seats before they are super picked over. I signed up and was able to shop early at all three sales. Some sales, though, will let you shop even earlier if you volunteer or consign. Since you don't have anything to consign yet, volunteering is the way to go. 3. Know what you want to look for and have multiple options. I went to sales looking for a stroller. I wanted a jogging stroller, knew they were expensive and wanted to try and get one for a good deal. Yes, I know that I'll have showers and stuff, but that's one less thing for someone to buy and more money for them to spend on something else. My first mistake was that I only wanted two brands of strollers (City Mini and UppaBaby) and didn't have other options. I found one stroller at the second sale that was one of the brands, but it was older and dirty looking. I hadn't done any research on any other brands and didn't really feel prepared to just buy whatever. For the third sale, I knew that I wanted a jogging stroller and had looked at a bunch of other brands and was able to get myself a nice Baby Trend Expedition stroller for $50. 4. Know the layout and get the big stuff first. Before my first sale, I did a bunch of research on Pinterest. Shocker, I know. A lot of people recommended getting your big items first and it makes total sense! These are the items that go first, so make sure you look at them. One consignment sale I went to was at a huge basically abandoned outlet mall and they had a map of where items were. Research the sale first, find out if there is a map and then map out your hit list. Most places will have either a check out for the big items or a holding room for you. They know how this works! 5. Set a list and a budget. If you've never been to a consignment sale before, it can be super overwhelming. I've done big sales before, so I had an idea of what I was getting in to, but Aaron was all, "so many deals!" I made a list of the items that I was looking for, the prices I wanted to pay and the budget I had set for myself. I was looking for maternity clothes (consignment sales are awesome for these, by the way! ), stroller, possibly a car seat. We don't know the gender yet, so it was hard to do clothes. And really, people are going to buy you clothes. There were also tons of rock and play/sleepers, boppy pillows, pack and plays, etc. The idea of a consignment sale is to SAVE money, not spend extra. So make a list of what you want to find, set a budget and stick to it! Make sure to check out Pinterest for other articles about how to measure and size your kids, the best items to shop for at sales, etc. Have you shopped consignment sales before? Great tips. I feel like NC have alot of thrift and consignment stores and ways to save! Great tips Sarah. I’ve actually never been to a kids consignment sale! I feel like it would be very overwhelming and I would leave empty handed. Womp womp. Great tips! I hope to one day have kiddos! These are all really great tips! We have bought so many things (mostly clothes though) second hand! You really can find great deals. And I agree - friends are the best shopping partners! These are really great tips! I have never shopped at the big kids consignment sales because they make me anxious, but I plan to try one in the coming year since we now have 3 kiddos and I am ALL about saving! Awesome tips and take it from me one can't have to many strollers. Less stuff you have to transfer from car to car.